My 10-year-old brother looks up to me. He is the one that keeps me motivated and striving for the best. Before attending a four-year institution, I used to tutor him every day in reading and math. Also, I tried to keep him active and engaged with school. I want to set an example for him and provide him with lessons from my life: there are people out there who can provide amazing support; you should never neglect your background and where you came from; you want to embrace the fact that, sometimes, being different can be beneficial. I was about his age when we came to America. I didn’t speak a word of English. In my new school I had a hard time making friends, because some of my peers would bully me for not being “normal” like them. I felt isolated from the others, but that motivated me to strive even harder to learn my second language, English. Around that time, I had asked my parents why other kids would tease me, for being “different”; That is when I had finally recognized that I was undocumented. At first, I struggled with this information — to realize that I could never travel back to my home country was heartbreaking. If it wasn’t for the teachers, mentors, and friends I’ve made along the way, I wouldn’t be where I am today, attending the University of Houston. I am set to be the first person in my family of seven to finish high school, attend a community college, and graduate from a university. As of now, my cherished goal is to help my parents finish paying for their house. My career goal is to join the United Nations and become an Ambassador. I want to learn how to speak to public policy professionals, and not just to be heard, but to be really understood and felt. And to be able to share and demonstrate how a true public service leader should live their life in an effective and moral way. 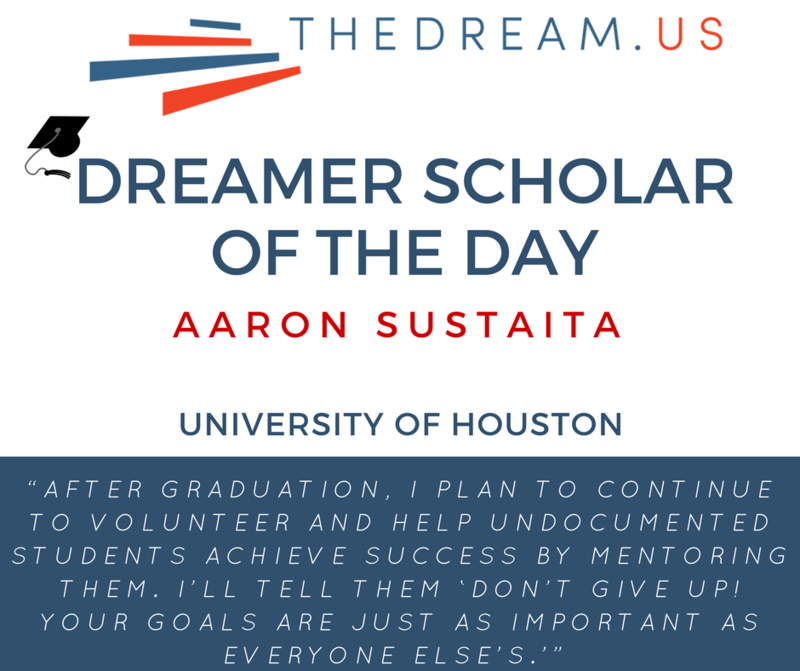 After graduation, I plan to continue to volunteer and help undocumented students achieve success by mentoring them. I’ll tell them “Don’t give up! Your goals are just as important as everyone else’s. You will succeed, but first you have to believe you can. And make sure to help others succeed along the way.”I will remind them that there are many people and opportunities in our lives that will help us along our journey, TheDream.US being one of them. Remember: help is out there. If you want to receive it, take hold of the hands that are reaching out and eager to help. You just might come across the right opportunity of a lifetime.